The show broadcasts live from the UK every Sunday night from 10.00pm GMT until midnight. 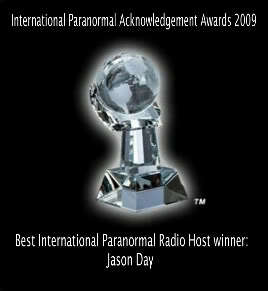 Join hosts Jason Day, Kelly McKenzie-Day, the White Noise team and their exclusive guests for a walk on the paranormal side, exclusively on BlogTalkRadio. and asking our guests question live on air. Watch Our *BRAND NEW UPDATED* Video To See What You Have Been Missing!!!!!!!!! © The White Noise Paranormal Radio/Phantom Encounters 'Phantom' logo is sole copyright of Kelly McKenzie-Day and a Trademark of Phantom Encounters Ltd.
Use of this logo for any means other than promoting White Noise Paranormal Radio or Phantom Encounters Ltd will not be permitted under any circumstances; please do not ask. Use without permission or for purposes other than stated above will result in prosecution. With an attitude best described as cantankerous Jason is not afraid to routinely ask the tough questions, or argue the point. Having interviewed Derek Acorah, James Randi, Ciaran O'Keeffe, Richard Felix, Mark Webb and Phil Whyman on previous occasions he's willing to ask the questions the public REALLY wants to know the answers to! Wanting to believe but more cynical than she's ever been about the paranormal world; Kelly is sometime mediator and sometime co-conspirator to Jason in his interviewing. Inbuilt diplomacy & an administrative background means she's the 'go to' girl for all your forum questions.